I'm not sure how they do it, but Engadget has gotten their hands on what appears to be promo photos of the much rumored, might as well just announce it now, Centro that will be appearing on Verizon Wireless soon. "Citing an unnamed official at Compal Electronics in Taiwan, the Wall Street Journal says Dell is planning to launch a low-cost 8.9-inch mini-notebook, possible as early as June. This device, which reportedly will be produced by Compal, will start at $400." If this rumor turns out to be true, my problem about what subnotebook to get will be moot. Since my company uses Dell hardware, it should be easy to get a unit in for "evaluation." I will have to keep an eye out for this new device. Clarifying an earlier post today, Brighthand's Editor in Chief, Ed Hardy, has posted an update to the Sprint Treo 755p story. "Sprint has not discontinued the Treo 755p from its smartphone portfolio, however, we are currently addressing temporary outage of inventory which is why the handset is not currently featured as part of our online store at www.sprint.com. Sprint plans to continue offering these handsets and investing in new Palm products throughout 2008." Sprint Treo 755p customers, myself included, can breath a sigh of relief. What happens when Dad, two Jr. Podcasters, and Snow the hamster are left unsupervised in a house full of gadgets while Mommy is out at a baby shower? Click the thumbnail below for the full story. Just be glad you don't have to live in my house. 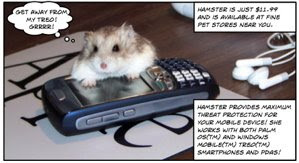 No hamsters, or Treo smartphones were hurt while making this ad poster. "The icons do look "ancient" but it's great to see PalmOS again. Turning the iPhone sideways produces a much smaller screen. I do wish there's a landscape version too!" I know that many Palm OS fanboys/girls will be looking forward to the official release of the emulator along with Tyler Faux's follow up to LudusP, Shark Radiology. Hope you all had a happy April Fool's Day!